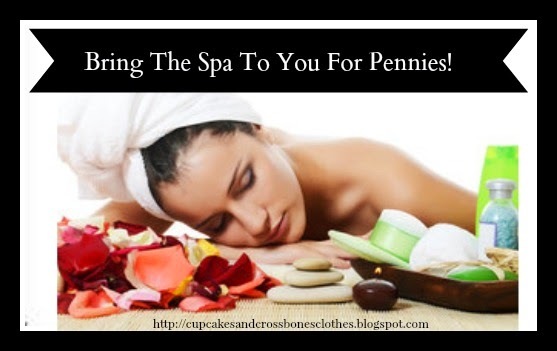 Bring The Spa To You For Pennies! Why go to the spa and spend ridiculous amounts of money when you can bring the spa to you. There are tons of great ways to get yourself lookin and feelin good in the comfort of your own home for pennies! Whether it is a relaxing night alone or a romantic evening with that special someone, here are some great ideas to create your own relaxing spa treatments. Create a hydrating and repair hair mask with 2 ingredients from your kitchen. -Combine the 2 ingredients in a small microwaveable bowl and place in the microwave for 30 seconds. -Massage the mixture through wet hair and let it sit for 30 minutes. -Wash hair with shampoo 2x's for shiny, healthy, and soft hair. Create a relaxing bath with 2 ingredients that will sooth your skin as well as your mind. -Run a warm bath and pour your 2 ingredients in. Light some candles and put on some relaxing music to enhance your relaxation time. On your feet all day? This home treatment is the ticket to soft and relaxed feet! -Soak your feet in the mixture as desired. This mask works great at getting rid of dead skin cells, removing impurities, reducing redness, and minimizing pores due to its salicylic acid in the strawberries. Use this lip scrub to get smooth soft kissable lips! -Wipe of the sugar mixure with a towel and apply a dab of petroleum jelly by itself to your lips. Have you ever done your own at home spa? What are your favorite at home spa treatments? Have a Picture of you creating your own at home spa night? Join us on Pinterest, upload your image, tag us, and add #RockinTheSweetLife to be added to the Cupcakes & Crossbones V.I.P Board! I need to do that hair mask tonight!! I love a good lip scrub, especially in the winter. The hair mask works so well! Its def a staple in my beauty routine. Hey Kristen, thanks! They all have been Tori tested and approved and work great! Oooo love the recipe for the leg oil. I think I have all of those. Definitely going to have to give that a try! Yes! Let me know if you love it as much as I do! Those beauty recipes sound amazing! I used to make my own natural stuff all the time. I am not a huge fan of face masks because of all the chemicals so I would make an oatmeal/honey face mask and it worked wonders without being hard on my sensitive skin. I need to try making my own natural beauty products again. Hey girl! Thanks! They seriously work wonders, are so inexpensive, and work so much better than some of those fancy products that are out there. AH! I can't wait to try some of these! Hi Tausha! Let me know what you think...They are all a total win in my book! i love a diy--no surprise, right?! where did you get your recipes from? Hey girl! Yes! No chemicals and all of that extra junk they throw into products that you purchase at the store. Some of the recipes I started using a while back in my high school/college days and then I just improved them as time went on. Others I learned from friends and family memebers who were nice enough to let me in on their secret beauty recipes!